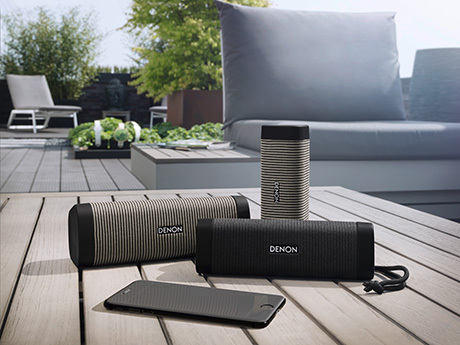 Denon Envaya is the perfect utilitarian speaker. Whether you want a soundtrack to your cooking, to fill your front room with music or pack a speaker in your bag and enjoy your tunes on the move, Envaya does it all. The IP67 dust and waterproof rating means there is nowhere that you can’t take Envaya. From the washing up bowl to the pool it is ready when you are. Tuned by Denon’s class leading audio engineers, each speaker has been painstakingly crafted to achieve an unmatched musical performance. Implementing innovative digital sound processing techniques, powerful amplifiers and high-quality speaker chassis, the range is capable of creating an immersive soundscape that easily annunciates the subtlest of high notes, whilst simultaneously having the ability to deliver deep bass tones with complete control and clarity. Simple connectivity and Siri activation allows you complete, hassle free control, from your smartphone. Extraordinary sound quality is further improved due to the inclusion of advanced audio processing technology, bigger size drivers and more powerful amplifier modules.The sound produced is above and beyond anything that conventional compact speaker systems deliver, thanks to 'oversized' proprietary drivers paired with a large passive bass radiator that fit neatly into this speaker's compact design. Performance is finely tuned with a range of advanced, on board, patented signal-processing technologies that 'intelligently' provide the best possible sound performance from any connected source. The audio tuning is done by our audio experts taking care of the Denon sound philosophy. 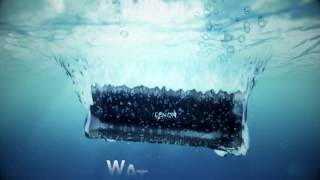 Denon Envaya is Water and Dust Proof. The official rating is called IP67, which means that the Envaya Pocket can stand in 1m of water for 30 minutes without damage. To achieve this all connectors are covered by a cap, gaps are closed by gaskets and chassis are water resistant which means altogether no water can enter the unit for a certain period.